The Neat Seat is the most comfortable portable personal comfort to take to watch your favourite sporting event, concert or where ever stadium seating is too hard. The Neat Seat is made from shower Proof nylon with comfort cushion and back. 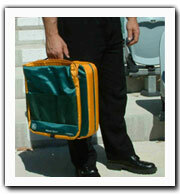 With a storage bag that hangs behind your legs for easy access while watching your favourite event. Weighing only 1.1KG (without personal items), The Neat Seat has Shoulder Strap and carry handle for Easy carrying. The Neat Seat is easy to place on to stadium seats in 2 Easy steps for hours of comfort. With a 50mm thick cushion foam and 25mm back rest foam plus 2 handy pockets for personal items such as food, drink, Jumper, radio, wallet, keys and tickets ETC.